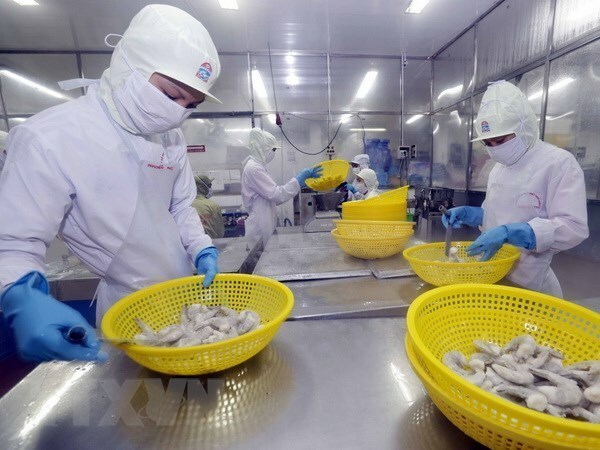 Hanoi (VNA) – The European Union (EU) was the largest market of Vietnamese shrimp in the first two months of 2019, according to the Vietnam Association of Seafood Entrepreneurs (VASEP). During January-February, export value of Vietnamese shrimp fell year-on-year by 15.2 percent to 373.6 million USD. Accounting for 20.5 percent of total export turnover, the EU secured its position as biggest buyer of Vietnamese shrimp. Within the EU, the UK, the Netherlands and Germany were the top purchasers. White-leg shrimp continued to occupy a key position in this market, making up 82 percent of total shrimp shipments. Spending 67.7 million USD on Vietnamese shrimp in the period, Japan was the second largest buyer. Experts have said that shipments to the East Asian country have shown audacious signs from the outset of the year, with the Comprehensive and Progressive Agreement for Trans-Pacific Partnership (CPTPP) taking effect from January, and completion of tax reduction progress under the Vietnam-Japan Economic Partnership Agreement (VJEPA). Local firms may bolster exports to the market as Japan has applied a zero percent tariff on Vietnamese seafood. Meanwhile, China ranked third by spending 62.3 million USD on Vietnamese shrimp. Currently, Vietnam is the sixth largest shrimp supplier for China with 5.7 percent of the market share.